British "blitz" Spirit? Not much! So - we've had a week to get used to things, accept our lot, and start looking to the future. In fairness a lot of folk are doing just that, but there is still, and has been throughout, an extraordinary amount of weeping, wailing and gnashing of teeth from both sides. Now I'll stress from the start, this is NOT a political post - I've never done politics on Social Media and I have no intention of starting now. What it is though, is a comment on some of the frustrating, upsetting and just plain inaccurate things I've heard and seen over the past week. The most alarming thing, possibly, is the people who are saying "But we were misinformed, we were fed lies" - you know what, and I hate to break it to you, but in ANY campaign of this type, both sides of the argument will twist the truth, embroider the facts, and tell you what they think you want to hear. Of course the "£350million per week to the NHS" claim on the Leave side is well documented now - but it wasn't just them who were - let's be charitable here - stretching the truth. One of the more dangerous lies I saw was on an extremely official looking leaflet from the Remain camp - so official looking in fact that at first, I thought it was the "impartial advice" that was being sent out. 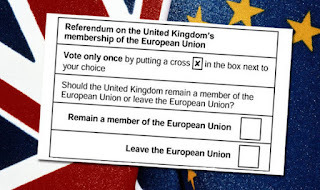 On the reverse of the leaflet it said (not exact wording) "If you're unsure which way to vote, then the safe option is to vote Remain as another vote can be held in the future". I do find myself wondering how many people took that "advice" to heart in spite of the fact that it is categorically false? The bottom line is that all the information was out there and easily accessible. (For the purposes of this I'm assuming that you are computer-literate and have access to the internet). I found enough information out there from various sources to make an informed decision - so what was your excuse for not doing so? If you expect all the information on something this important to be spoon-fed to you then I think the bigger question is actually whether you're responsible enough to be given a vote in the first place! Next up - "Oh but it's alright - this referendum isn't legally binding" - well if you'd bothered to do any sort of research at all, or even taken the trouble to ascertain what you were being asked to vote in, you'd know that referenda are essentially an advisory instrument - designed to gauge the feelings of the country's voters on a particular issue. Had you done that research, you might also have understood why that lie I've mentioned from the Remain campaign above is so critical - in a referendum, if you are unsure which way to vote, you'd be very well advised to NOT VOTE AT ALL. Too many people failed to understand that a) this was a seriously important question and b) yes - regardless of the result it is possible that a further vote will be held on the subject in the future - but that "future" is likely to be a VERY long way away - decades not years. For a lot of us voting this time round, the "further vote in the future" is simply not likely to be in OUR future. A few other classics - "The turnout was too low for it to count" - the turnout was 72.2%. For reference, that was the highest turnout at the polling stations for a UK-wide vote since 1992. Do you want all the General Elections since then re-run as well? Shall we start with 1997? No, thought not. As a point of interest, less than 36% of voters in the UK turned out last time there were European Parliamentary Elections - and from 1979 - 2014 the highest turnout EVER was 38.52%, if that doesn't underline the apathy that the UK felt towards the EU, I don't know what does. If we accept that you do have a valid point on the question of turnout, the turnout in the 1975 EC (Common Market) referendum was even lower than this time round...SURE you still want to use that argument? "There should be a 2nd referendum held" - why? 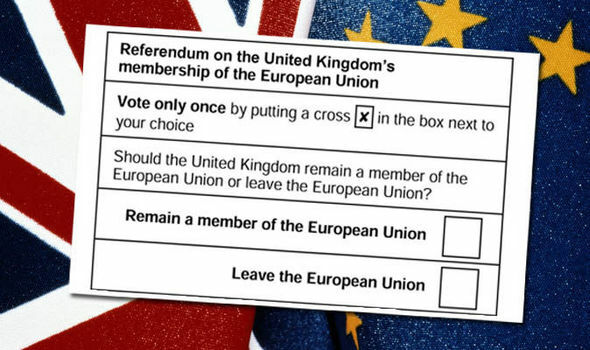 The country was given the opportunity to a) Do our research b) make an informed decision and c) Get to a polling station and vote - on what basis should the vote be re-held? Because you couldn't be bothered? You do realise that this wasn't a playground game of "Rock/Paper/Scissors" - that when you lose, you can badger your mate to go "best of three"? "All Leave voters are racists who only voted because they want to stop immigration" Nope. And if you're trying to soften it by saying "the majority of..." then nope again. Just 33% of Leave voters polled stated that "regaining control over immigration" was their primary reason. And you'll note - "control over" rather than "preventing". I've heard so many people saying "I'm really angry" - and I can understand that anger, but NOT that it is being turned internally, turned against the country and its people. Fear too - frankly anyone who's jumping up and down with glee now and saying everything is going to be wonderful should be locked in a room with Nigel Farage and several very hungry Pit Bulls IMO. It's right to be wary of what's ahead - in fact it's helpful, a degree of fear helps to make sure people inform their choices - maybe the vote would have been different if there had been less complacency on the Remain side - let's face it, the majority of us assumed it would be a vote to stay. (That's fact, not opinion - 7 in 10 voters expected a Remain win). Fear is a rational response - panic, however, isn't, and certainly isn't helpful in a situation like this. Martin Lewis of Money Saving Expert said on this subject "The most important thing we can do is keep calm, carry on and act Normal. If we can manage to do that collectively, the impact of this sentiment change will be minimal" and also quite rightly that it's perfectly possible to talk ourselves into a recession - really not what anyone wants, surely? (He's also put together an interesting "Brexit Q & A" which can be found HERE - well worth a read). So, from now on, can we all start trying tio look forwards, not back. There's no place for hate, whether pointed at those of other nationalities, or at those who chose to place their X in a different box to that which we chose. Anger is great, it can be a very positive, driving emotion, but if it's directed at those who "misinformed" you, perhaps it's time to stop and think where the responsibility for that REALLY lies - in the information that "they" provided, or in your lack of challenge to that information? NOTE: - I've thought hard about whether to disable comments on this one. At the moment I'm leaving them open, but some rules: Your comment does not descend into political ranting. Be polite and above all constructive. No abusive language. Bear in mind that I've not said which way I've voted, and nor will I. You may disclose as you choose but please respect my decision and avoid speculating on what you "think" I chose - you stand a 50% chance of being wrong, in any event. ;-) I'll be deleting comments that don't respect the above.